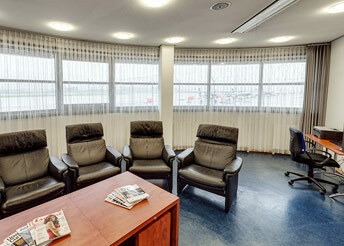 The VIP lounge in the front of the building has diverting views of the airfield with exclusive catering on request. Pick your choice from our refreshing self-service selection, whether it is Küchenzauber from neighbouring Denkendorf, menus from LSG Sky Chef or hearty food from Mozer butcher's shop. Travellers and crews can settle down in modern Relax easy chairs - or deal with some business using our free WLAN and TV and talk with one another. Small conference tables creat a comfortable atmosphere for short meetings or office work.